Our CD would fall under the genre of "Salsa". It is very dancer friendly and it has become a favorite CD by many DJ record pools. 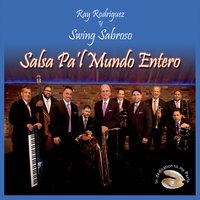 Since it’s inception in 2000, Ray Rodriguez y Swing Sabroso have generated a growing number of loyal fans with a hot “salsa dura’ sound. The group’s distinctive style is the result of the unique and extensive musical back grounds of the band’s individual members, who have performed and recorded with some of the most recognizable names in Latin Music before joining together to intergrate Swing Sabroso.